Soft pedas and ladoos are always loved by kids. Made during special occasions like marriages and festivals, they appeal to adults too. We have a quick Diwali laddoo/laddu/ladoo recipe collection which you can easily make at home without putting too many efforts. Laddoo are round shaped mithai made using a various ingredients like flour (besan, atta and so on) , coconut or semolina, sweetened with sugar, condensed milk or jaggery, perked up with cardamom powder, saffron, dried-fruits. You can even use millets and multi-grains. This section introduces you to some evergreen favourites and popular ladoo recipes like the Churma Ladoo, Motichoor ke ladoo and Besan Laddoo. Not only Diwali, laddu recipes like Coconut and Rava Ladoo or just Coconut Ladoo are specially made during Ganesh Chaturthi to serve as naivedya to Lord Ganesha. Also delights like Peanut Ladoo and Til Ke Ladoo are made during Makar Sankranti and exchanged among people saying, “ Tilghud ghya godd godd bola" that means to forget the past ill-feelings and speak sweetly. Apart from the sweet delights, many ladoos are spicy. These are generally made of special ingredients like sesame seeds, fenugreek seeds, edible gum, dried ginger powder etc. and are loaded with ghee. These are made especially for pregnant ladies to fortify their health and provide warmth to the body during those 9 months. They can eat these for breakfast with a glass of milk, as it is not only nutritious but also, quite filling. 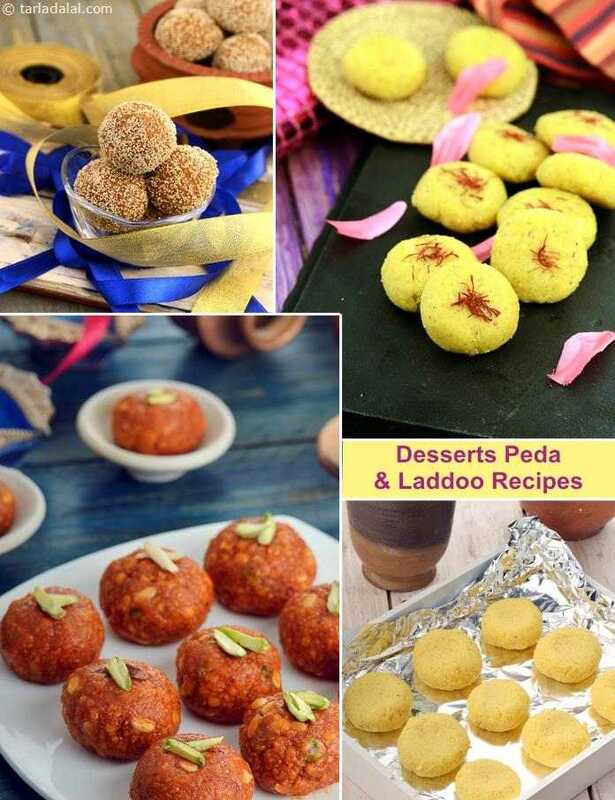 Below is a collection of ladoo and peda recipes with step by step images that would help begineers to make yummy indian sweets at home without any hassle. Most laddoos can be made and stored in air tight container for 3-4 days. You can also serve them as an evening snack or in the dabba as a sweet accompaniment. You can even increase/ decrease the amount of fat and sweetness in the recipe according to your personal preference. Watercress seeds or halim/aliv are nutrient rich tiny seeds that serve 100mg iron/ 100 grams of seeds. You can make healthy Halim Ladoo by combining other iron-rich ingredients like jaggery and almonds. The healthy peda made without the use of any dairy products and healthy flours like ragi and powdered chana dal has a very pleasant taste. Apart from these, you can make malai peda using low fat milk and sugar substitutes which are not only tasty but also, healthy. Making Indian mithai is time consuming and requires a lot of patience. But, people who want recipes that they can whip up in a jiffy, we have something for you. 1. Nuts Khoya Ladoo, delicious, melt-in-the-mouth laddoos requires no cooking. You just have to mix together all the ingredients, shape them and refrigerate. 2. Besan Laddoo makes use of the microwave and can be made quickly. 3. Peanut Ladoo is a super tasty sweet treat, that lasts for 3-4 days and requires not more than 11 minutes to cook. If you enjoy our peda recipes, laddo recipes then you will enjoy our other Indian Dessert articles.